Did you know that all of our body systems development, such as our immune, digestive, circulatory, immune and respiratory systems, are influenced by our in utero and birth experience and are controlled by the Autonomic Nervous System? 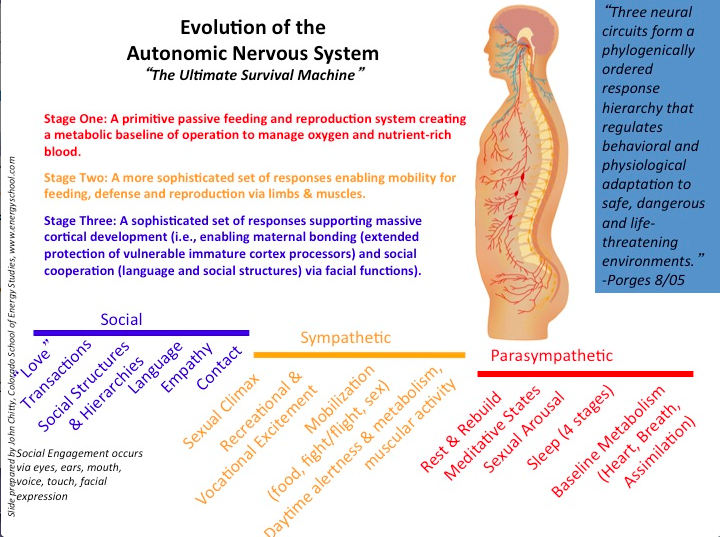 The importance of the ANS (Autonomic Nervous System) in the past has been under-valued and little was understood about the importance of the birth and bonding process in relation to how the ANS was setup. There was very little understanding about babies being conscious beings both in the womb and at birth and it has only recently been understood and accepted that babies feel physical pain. In Heal Your Birth, Heal Your Life we cover many of the effects that our time in utero and our birth can have on us both physically and psychologically. How emotional and physical neglect, abuse and trauma can effect us and most importantly offer tools to not only transform the trauma, but to rewrite the trauma and rewire the neurones in the heart, brain and nervous system. The traditional view of the ANS is that it controls most of our body’s involuntary activity, including essential survival functions including circulation, respiration, digestion, metabolism, daytime alertness and mobilization, nighttime sleep and regulation and more. In addition, the ANS operates our stress responses such as “fight and flight” as well as “freeze”. Its main function is to assure our survival by constant adaptation to changing conditions. Let us explore in more depth the role of the ANS. The ANS consists of 3 branches. The most commonly understood are the first 2 branches of this system. The most ancient part is the Parasympathetic System (rest and rebuild) and very much linked to basic survival controlling baseline metabolic functions, delivering nutrient-rich, oxygenated blood to the system, particularly the brain, and its components regulate heart, lungs and viscera. It also controls sexual arousal, sleep and meditative states. When under an extreme life threatening situation this part will cause disassociation, freeze, catatonia and the heart rate can drop and we can fain death. The Sympathetic System is the system that controls movement, feeding, reproduction, our defence system such as fight or flight from a dangerous situation, daytime alertness and metabolism, and muscular activity. The Sympathetic System is the controller over the Parasympathetic System. If you look this picture to the left you can see how the Vagus Nerve is connected to the area of our vital organs and influencing their growth, function and development depending on whether we are living in a safe, dangerous or life-threatening environment. It is only recently through the work of Stephen Porges on the Polyvagal Theory we are now able to understand more about the most modern development – the 3rd social branch of the ANS. This newest social branch is the controller over the Sympathetic System. This branch is essential in bonding and your ability to make social interactions with others as well as in the development of our compassion and empathy. It is vital in helping us to self regulate our emotions and our behaviors and helps to down regulate the heart. This branch plays a vital role in bonding and is effected by visual contact and facial expressions and hearing the soothing tones of the caregivers voice. These trigger neurotransmitters inducing pleasurable sensations in both the infant and the mother, promoting a feeling of safety, trust and connection. However, if the infant doesn’t experience all of these responses from the caregiver they then feel unsafe, unloved and betrayed by the caregiver and the world. This results in an inability to self regulate their emotional state and their ANS. Interestingly the feeling of being betrayed by an important person in our life, is what can cause severe trauma. 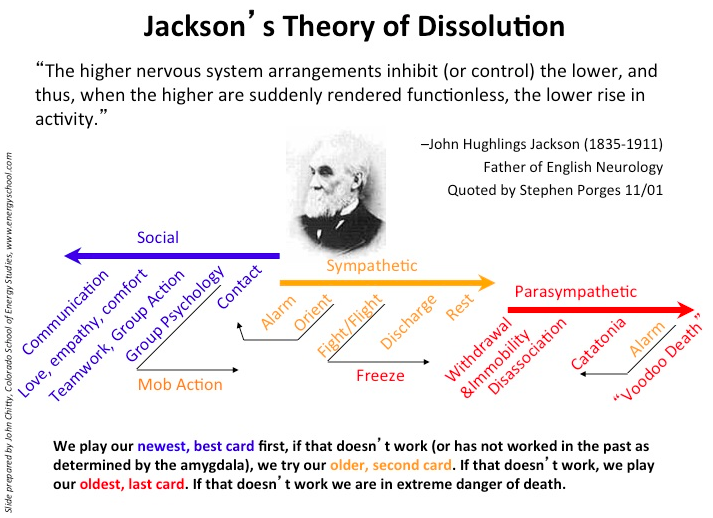 John Chitty, explains in the slide below how the nervous system arranges itself, going from the Social, Sympathetic and then Parasympathetic. What is interesting is that if we learn as a baby that the Social card doesn’t work, that there has been no reassurance from the caregiver, no love, empathy or comfort when we are distressed then we shut this social option down. Traumatised babies are often shut down and are mistakenly labelled as good babies, who rarely cry, by their caregivers. These babies have learned that crying is not going to bring them what they need or that is can bring danger. I have worked with clients who were premature or abused as babies and describe silently crying inside, too afraid to make a sound. When a trauma occurs these babies learn to go straight to fight/flight or freeze/disassociation. This is often why people who have PTSD have a history of some form of abuse or neglect and are therefore more easily triggered into the lower more basic form of ANS stress responses. Here is a wonderful example of how easily and quickly this feeling of loss of connection can occur in Dr Edwards Tronick’s experiment with a mother who is asked not to respond to her baby and to show no emotion on her face. Warning if you have experienced some form of neglect as a baby you may find yourself being more than mildly triggered by this video. Please go to the video at the end of the page for help. Notice how quickly the baby responds by trying to get his mother’s attention. Because newborn babies are so helpless and vulnerable they are programmed to do whatever it takes to get their mother’s attention, as being neglected could mean possible death and their ANS is triggered into action. I often find clients who have been premature babies, been separated from mum at birth, have birth trauma or have experienced some form of emotional neglect, describe themselves as having a low level of anxiety constantly present, this anxiety can easily be triggered to panic attacks, as they have no ability to self regulate these emotions. Their whole body system reacts as if the danger is happening now. They find it difficult to form relationships and often will have some or all of the symptoms of PTSD. Wow ! Congrats on sharing the complex in such a beautiful, readable way. I have been so appreciative of learning about this research in my own training and use the related tools as my primary approach in a process of healing from a chronic illness. The links between history and symptoms can be very subtle but once you get familiar with this perspective, you start to see it everywhere you look. It’s a process that is taking much longer than I ever expected but the journey is filled with learning about the deepest details and the implications of this new science that is unfolding. Wishing you all the best in continuing to get that information out there in such manageable ways!! Thank you for your lovely comments Veronique..